The spa that got lost. 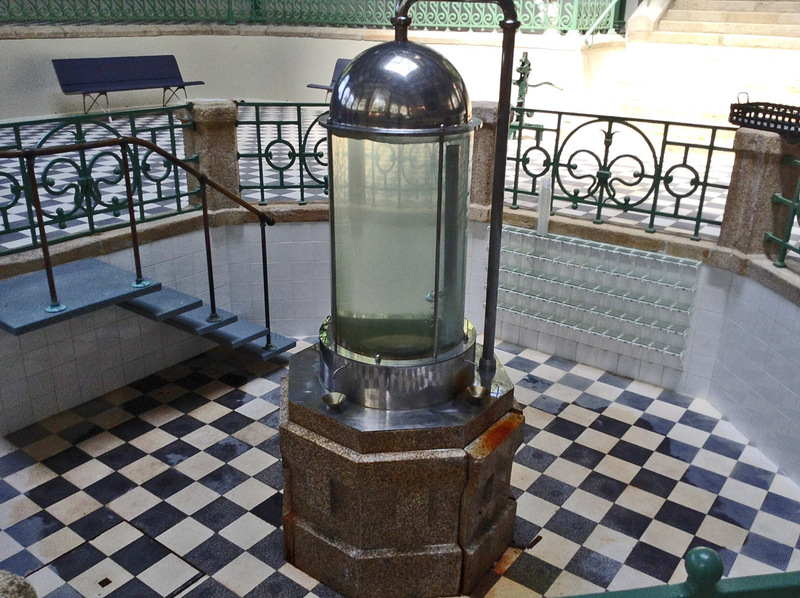 Here it is, the Termas do Peso - the mineral waters of Peso. This is the spa that got lost. To find out why how the Termas do Peso got lost, click here. OK! So both you and I know that this spa isn't lost. In fact, spas obviously can't get lost. Yet all the same that's how it seemed to me for quite a while. Let me tell you why. In 1992, up by the Minho River, before the spanking new road was built, I walked down the main street out of town - now a backwater - through a wooded glade and into a sunny clearing, where I came across a glorious building made of wrought iron and glass. Inside I went down the steps into a cool, grateful shade and drank a glass of the tastiest, natural, slightly sparkling spring water that I've ever drunk. There was none of that smelly, foul tasting volcanic water that you find in places like Harrogate. I fell in love with this spa there and then. Over twenty years or so, I never forgot the building where the bubbles rising slowly through the water in the glass tank were echoed by the rings of coloured glass in the windows and doors. I still remember the yellow and red circles reminding me of the boiled sweets of my childhood. Then four years ago I persuaded my husband to go to Monçao so he could finally see the building I had been so fond of. Horror of horrors! The building wasn't there! In its pace was a dull modern spa with no character at all. I was heart-broken. 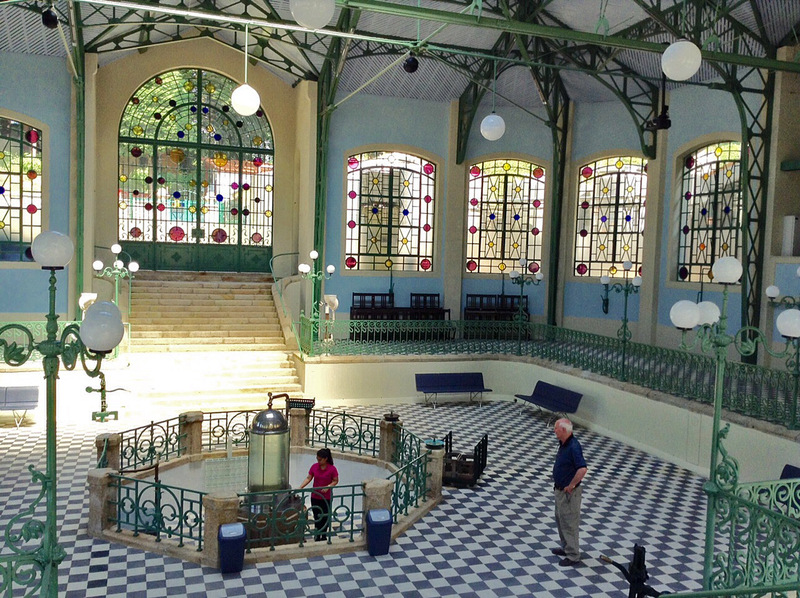 How, I asked myself, could the Portuguese have committed such an outrage as to destroy this glorious spa? Was it part of the lure of the new after decades of repression under the dictatorship? After all much of the Algarve had been ruined by rash development in the years after the revolution. I was grumpy for days. Last winter we went further north than Monçao, following the river to Melgaço, the final outpost of Portugueseness in the country before you enter the Spanishness of Galicia. 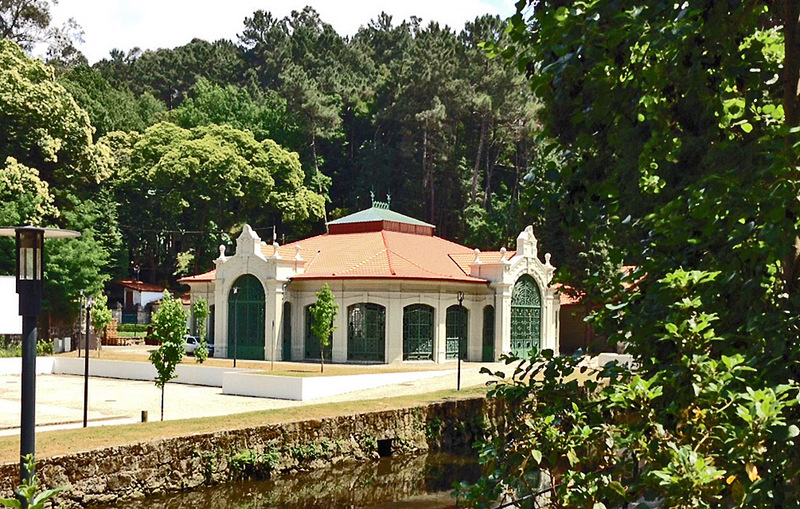 There, taking a backroad – the one that once had been the main road out of Melgaço – we came upon the signs for a spa. We went down a shaded avenue, past a mini-golf park to a tinkling stream. And Hallelujah! There it was: my long-lost, wrought iron and glass spa! I had got the wrong town beginning with M. The Termas do Peso were in Melgaço not Monçao! In winter the spa is closed, and anyway there was a cage of scaffolding around the building housing the mineral spring - far being destroyed, it was being renovated - so I could only try and peer through a coloured glass bubble into the gloom beyond, but still I could see the black and white floor tiles and the iron structure. It was still all there. Hooray! So this June we went again. Finally my husband could see the spa and drink the water. And now you too can see one of my favourite Portuguese buildings. If ever you are near Melgaço, do go and visit. Even if you don't want to drink the water you can have tea, coffee or a soda in the nearby cafe. But go anyway to see the airy building of wrought iron and glass.